IATA noted that more people were flying because of falling fares. Mumbai: Falling fares, more flights and the Diwali festival combined to drive air passenger growth in India, already the fastest growing aviation market, to 25.1% in November, leaving the US, the world’s largest aviation market, a distant No.2 with 9.1% growth. “India’s strong results reflect notable increases in service frequencies, ongoing economic strength and the timing of the Diwali holiday (November 2015), which occurred in October in 2014," said the International Air Transport Association (IATA), a lobby group of nearly 260 airlines representing 83% of global air traffic. Passenger growth in China, the third-fastest growing aviation market, was 8.4%, while Brazil and Russia shrank by 7.9% and 7.1% respectively. “Consumers continue to benefit from lower fares, which are spurring demand. The economy benefits from the stimulus to consumer spending. And airlines are starting to achieve minimum acceptable profit levels. It’s good news all around, but as we open 2016, economic risks are mounting," said Tony Tyler, IATA’s director general and chief executive officer. 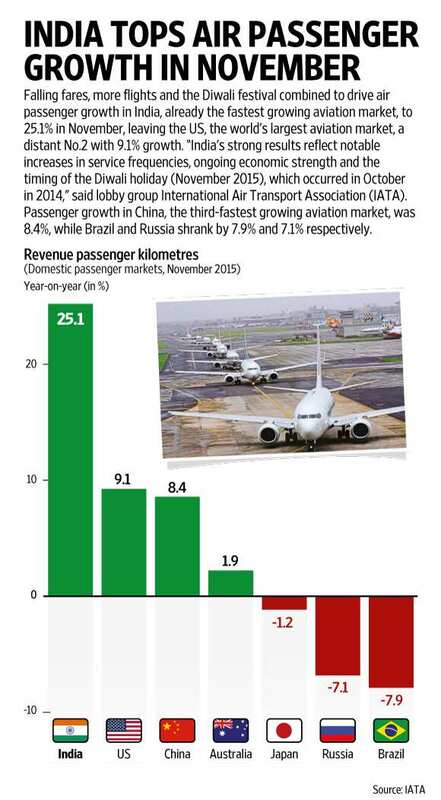 Passenger demand remains strong; however, the ongoing turmoil in global financial markets and concerns over slowing economic growth in China are casting a shadow over the New Year, IATA said in a statement. “The airline industry is delivering solid financial and operational performance. The industry’s return on capital for 2015 and 2016 is expected to exceed its cost of capital—a very rare occurrence. This means we are on the path toward financial sustainability. Consumers are benefitting from lower fares, and airlines are able to invest in new aircraft that are more comfortable, quieter and more environmentally friendly," Tyler said. In 2015, the price of benchmark of Brent crude fell 35%, while in 2014, it dropped 48.3%. In India, fuel costs count for about 45-55% of the revenue of domestic airlines, and a 4% reduction in fuel cost adds around 2% to the operating margin of airlines.